Brand new and sealed 1 Ounce Platinum Bullion 999.5 Fine Credit Suisse bar. Supplied sealed in original Credit Suisse packaging with certificate. Each bar contains at one ounce of 99.95% pure investment grade platinum bullion. The front of the bar features the Credit Suisse Logo, with the weight, fineness and serial number of the bar engraved at the bottom. 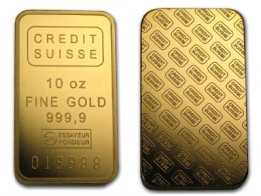 The reverse of the bar features a repeating pattern of the Credit Suisse Logo. 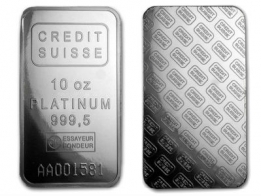 Credit Suisse produces platinum bars in 1 gram, 5 gram, 1 ounce and 10 ounce sizes. However, the 1 ounce size is the most popular amongst platinum investors. 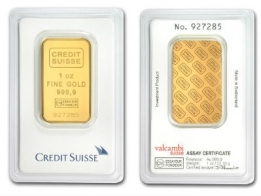 In addition to its platinum series, Credit Suisse also produces investment precious metals bars in gold, silver and palladium. 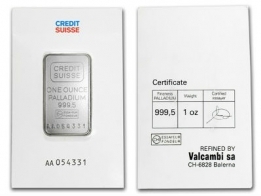 All bars sold by Credit Suisse are manufactured by Valcambi, one of the most prominent precious metals refineries in Switzerland. Bar supplied will be either Credit Suisse or Valcambi, who manufacture Credit Suisse bullion.